If someone sat down and designed Hydrangeas on purpose, we would say they had come up with a product that is just too confusing. The public won't buy it. But people do buy them, and then they have questions. Some hydrangeas bloom on old wood, so you should cut them back right after they've bloomed in the summer and then leave them be until spring. But spring comes and they are so slow to leaf out, that anxious gardeners sometimes cut them back, thinking they are dead and then wonder why they have no blooms. And sometimes, even though the hydrangea might bloom on old wood, it dies back anyway to the ground, and so the gardener has no chance of blooms, regardless of when they pruned. Then one day, someone discovered a hyrangea that also blooms on new wood. So now we have a hydrangea that can be cut back in the spring or die back in the winter, and you still have blooms in the summer. I've got some of those, the infamous 'Endless Summer' hydrangeas, pictured above, blooming on new wood. It's good these hydrangeas bloom on new wood because they always die back to the ground over the winter in my garden. 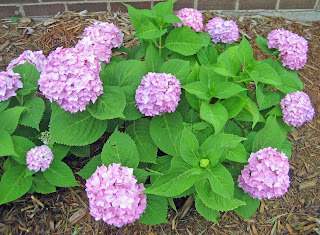 As if that isn't enough to keep straight, you can change the color of some hydrangea flowers from pink to blue or blue to pink by lowering or raising the soil pH. The lower the pH, the more acidic the soil is and the more blue the flowers will be. You can see that I have alkaline, high pH, soil. Who needs a soil test kit when you have hydrangeas in the garden? It's no wonder that my co-workers ask me questions about their hydrangeas. Today, I had two people ask me about hydrangeas. The second person said she had one big branch growing on her hydrangea but the rest was real low to the ground and it wasn't blooming. She thought it was a variety called 'Angel Eyes'. I said I thought that was odd, and she might prune it to shape it up a bit, but be careful because by now, whether it blooms on old wood or new wood there should be flower buds. Later in the day, since she was working at home, she took a picture of her hydrangea and sent it to me. Once I saw it, I immediately was able to diagnosis her problem more precisely and called with my advice. Do you see her problem? I've marked the photograph so you won't miss it. Her big long 'branch' is no hydrangea, it's a weedy ol' mulberry tree! Go ahead and laugh, I did. As they say, a picture is worth a thousand words. I don't know how gardeners answer questions on radio talk-shows, like Layanee does in Rhode Island, when people are only able to describe their problems and not show a picture. My co-worker described her problem as "I have one big branch and the rest are small", not as "I've got a gigantic weedy tree growing on top of my hydrangea". In her defense she pointed out how much alike mulberry and hydrangea leaves are. Yes, of course, they are both green. My advice to her was to dig out the tree and the tiny, struggling hydrangea, separate the two, throw the tree out, and then pot up the hydrangea and put it on her patio where she can keep it well watered. Then I looked up 'Angel Eyes' on the Internet and saw that it is generally only hardy to Zone 6. Uh-oh. She's in Zone 5a. Her best bet now, in my opinion, is to grow the hydrangea in the pot year around and put it in the garage in the winter time. Or give it very good protection in the winter time, and expect it will die back to the ground each year. I am posting the pictures, not to make fun of my co-worker who knows I am posting about her hydrangea, but to let others know how they should solve this problem, should they encounter it in their own garden. When I saw your first picture without the notation my first thought was "it's not a hydrangea." I couldn't even see the hydrangea until you pointed it out! Too bad it's not very hardy. She could use some stone around it as a mulch which would absorb some sunlight during the winter and may help the hydrangea survive, but since hydrangeas like the shade there may not be any sun. After a dog sitter "helped me out" by trimming back my hydrangeas in the spring, I was reading earlier this year that the old wood/new wood blooming theory doesn't necessarily hold water. Thanks goodness too because my Nikko Blue hydrangeas are the prettiest ever, despite their untimely haircut. Will I trim them again in the spring? No. But I also won't be unduly worried if someone else does. Don't you wish all gardening questions were that simple? There is a way to have that Zone 6 Hydrangea bloom in Zone 5a, but it ain't pretty. It involves a plastic garbage can & lots of shredded leaves or straw. Remove bottom from can & use like a giant Rose ring. Looks really ugly in the winter garden, but if it can't be seen from the front of the house or a window, it's worth a try. I use wire fencing & shredded leaves, which is more unobtrusive, but I've got Hydrangeas that bloom on new & old wood. I look with a wee bit of envy at your Hydrangeas...they like water too much for clay and limestone. But oakleaf and annabelle do well here. go ahead cry. I did. All that bush has now is neither old or new wood- dead wood. Friend told me, wait until it takes the transplant into the ground well. what started as a very blue bush is now becoming pinkish- and I have acidic soil- so go figure. But my question is, when the flowers start turning - well, is that brown or tan? dried out....do we dead head them for more blooms?? your picture story is funny- when I saw the first picture I thought, hmmm, that must be a strand of hydraenga that I don't know. I've seen some strange looking things that people call hydraegnas. Funny story and good advice, Carol! Your post flashed me back to a discussion with my brother about why he let a large buckthorn grow right in the middle of a forsythia... "what tree? It all looks the same"...yeah, green and brown. Carol: First, thanks for that link! I would say that the hydrangea questions are top on the list. 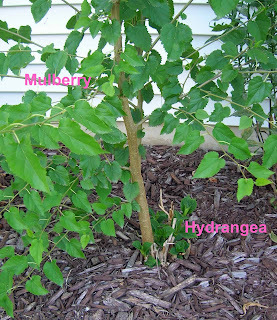 When to prune! Why doesn't mine bloom? This necessitates the question 'What kind is it' and most people don't know and don't realize just how many varieties of hydrangeas there are, over 70 species. The blue mophead is the most popular! Grown well, it is spectacular! As to comment and answer a question after a description such as the one you encountered well, sometimes it is impossible! I know you are doing a great job dispensing advice so, keep it up! I hope your coworker doesn't mind that I can't quit laughing. That's funny, Carol. And it reminds me of some silly mistakes I've made before, like when I marveled at the gazania that lived through the winter and I babied it in the spring until it bloomed and I found out it was a dandelion. LOL. I made a post last week about hydrangeas and making them bloom blue. It's not just the acidic soil, it's the availability of aluminum in the soil as well. Acidic soil allows the plant to utilize the aluminum better, thus making the blooms blue.